When shopping for a window air conditioner, it is good to keep in mind the extra features that are typically available and how those would benefit you. Additional features are intended to simplify the operation of the unit, and in some cases they can boost the overall efficiency. The thermostat on the window AC is what allows you to control the cooling output. Middle to higher end models will feature a digital thermostat that has a readout of both the selected temperature as well as the actual temperature. While the digital readout is more convenient they have also been shown to be more accurate and maintain a more consistent temperature in the room, and have an automatic shut off feature that will automatically cycle the unit on and off to maintain the desired temperature. Basic models include a mechanical thermostat that uses a dial to select the temperature higher or lower depending on where you turn it. Adjusting the fan speed on the window AC unit affects the rate at which your space cools down. Typically, you can select from two (low and high) or three (low, medium and high) fan speeds. This setting also affects the level of noise caused by the unit. If you’re using the unit in a bedroom, this feature is nice as you can select a lower, quieter, fan speed at night. A remote control allows you to operate the unit without having to use the controls that are typically mounted to the front of the window AC. Standard remotes let you control the temperature and fan speed while some also have a temperature display on the remote control. Additionally, some units have a magnetic hold on the side so that the remote can be placed there when not in use to avoid misplacing it. A timer allows you to set a delayed start or stop time, which helps manage energy consumption. Timers can be set in one hour intervals and usually go up to either 12 or 24 hours. When the window ac unit is off, setting the timer determines when it will automatically turn on. And if the unit is on, setting the timer determines the point at which it will shut off. Adjustable louvers let you manipulate the direction air is blown from the unit. 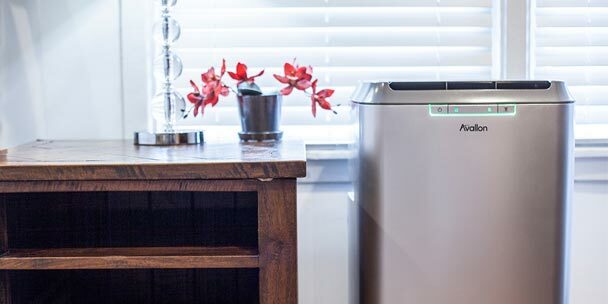 If the unit is going to be placed in a living room, being able to adjust the vent can mean keeping the unit from blowing directly on people who may be sitting in the living area. It also lets you optimize air flow in the space if you will be utilizing a room or ceiling fan. Standard – The most common filter type is a basic filter and it will need to be periodically replaced to ensure proper air flow and filtration. Washable – These filters can be cleaned in a kitchen or bathroom sink to avoid having to purchase a replacement. They are also quite durable and can withstand many, many washes. Units that carry an Energy Star rating can operate up to 15% more efficiently than units that are not Energy Star. Depending on how often you are planning to utilize your window AC unit, energy efficiency may be something you want to consider. The unit that I have hooks up to WiFi and can be controlled from a Mobil phone can you clue me in on how?